Australian scientists say it will take at least 500 years to stop the growth of five swirling masses of plastic waste in the world's oceans. Even that grim scenario would depend on an immediate ban on more plastic going into oceans, they say. A swirling mass of plastic debris was first discovered in the so-called north Pacific gyre about 15 years ago. Since then more areas of plastic have been discovered in other oceans. They have created soup-like areas of manmade material. A team of researchers at the Australian Research Council centre of excellence for climate system science has been investigating how they form. 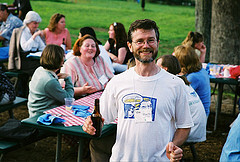 Dr Erik Van Sebelle leads researchers at the centre. He told Radio Australia's Pacific Beat the research shows the plastic accumulation is an extremely slow process. But it has seriously long-term impacts. "Even if we were to stop getting any plastic into the ocean tomorrow . . . then these patches would continue to grow for at least another 500 years," he said. "They would just grow and grow and grow because of all the plastic we put in the ocean already that hasn't even accumulated in these patches yet." Here are 13 great ways that you can give back to the river you love in 2013! Please feel free to share ideas with friends and colleagues, and Happy New Year! 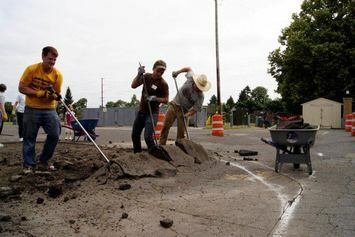 The folks at Depave in Portland, Oregon hold regular work parties where community volunteers can come and help turn unneeded pavement into rain gardens and other community assets. #2: Get the Junk Out! Rivers are not dumping grounds. But some people think so. Fortunately, many watershed groups organize regular community cleanups. Participate in a cleanup. If none are happening, round up 5 friends, some trash bags, and make a Saturday morning out of it! - You may think about rivers often but you'd be surprised how many people forget about them entirely. So if you are hosting a social gathering – a picnic, kids’ play dates, family reunion… propose to do it at a riverside park. Our rivers need more people to know them and to love them. Spread the word. 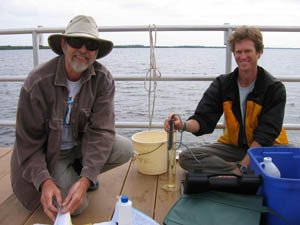 Become a citizen water quality monitor! All over the U.S., hundreds of local watershed groups operate volunteer monitoring programs and anyone is welcome to join! Find a local group near you! Our Partners at the Rock River Coalition in Wisconsin have an annual tradition of a float trip especially for elected officials that gives lawmakers a firsthand look at -- and greater appreciation for -- our most important natural resource! (roughly 1800 gallons per pound of beef), but if the water used to raise the cow is mostly rain water and the water used to grow soy is all irrigated, veggie burgers may not be a better option. Fortunately, there's a "Water Footprint" website that can help you start to make the right choices! Talk is cheap. If you love rivers and are not supporting at least one river conservation group, please do so. 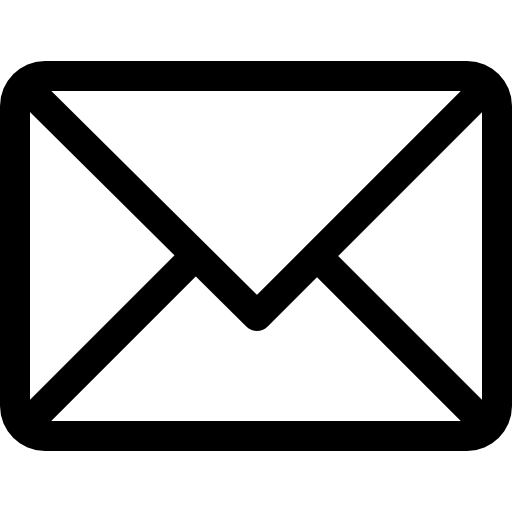 You can donate to River Network and/or any one of several hundred local Partner organizations near you! There's still time for a 2012 tax deduction too. Every donation helps! #8: Turn Out the Lights! For every gallon of water used in an average household, five times more water (40,000 gallons each month) is used to provide that home with electricity via hydropower turbines and fossil fuel power plants. You can get a conservation Three-fer -- healthier rivers, fewer greenhouse emissions and cleaner air -- by redoubling your energy conservation efforts! A two-foot diameter big leaf maple prevents nearly 2,000 gallons of stormwater and reduces CO2 by 600 pounds every year! Check out the benefits of your own backyard trees at i-Tree Design and plant more if you can! Disconnect the downspouts from your gutter and let the rainwater filter naturally into the ground. If drainage is an issue hook them back up to a rain barrel (see photo at left) that will store the water for you to reuse later! 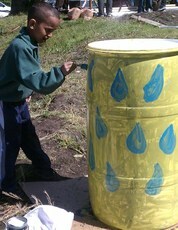 A couple of handy resources: “how to install your rain barrel” video and a flyer on painting your barrel. When you have to replace your brake pads, request ones without copper. (Copper dust comes out when you stop and flows into nearby streams, raising levels too toxic for fish) More info here. #12: Meet Us in St. Louis! If rivers are your passion and you've never been to River Rally, make this the year! We'll be in St. Louis May 17-20. You'll get to hobnob with hundreds of other river lovers, learn about rivers and how to protect them, and enjoy some quality river time via one or more field trips. Registration opens in January! #13: Make Your Own River Resolution! There are many other ways you can help protect and restore rivers! Make your own resolution and if you want to share it with others, post it on our Facebook page! Labels: River Network, What Can You Do? Currents, winds push debris to U.S. West Coast. Wednesday, January 9, 2013 at 2:00 pm , Wed Jan 9, 2013. LOS ANGELES (AP) — Volunteers who patrol California beaches for plastic, cigarette butts and other litter will be on the lookout this winter for flotsam from last year's monstrous tsunami off Japan's coast. Armed with index-size cards, beachcombers will log water bottles, buoys, fishing gear and other possessions that might have sailed across the Pacific to the 1,100-mile shoreline. The March 2011 disaster washed about 5 million tons of debris into the sea. Most of that sank, leaving an estimated 1½ million tons afloat. No one knows how much debris — strewn across an area three times the size of the United States — is still adrift. Tsunami flotsam already touched the Pacific Northwest and Hawaii in 2012. The West Coast is bracing for more sightings in the coming months as seasonal winds and coastal currents tend to drive marine wreckage ashore. Like the past winter, scientists expect the bulk of the debris to end up in Alaska, Washington state, Oregon and British Columbia. Last week, the Coast Guard spotted a massive dock that possibly came from Japan on a wilderness beach in Washington state. Given recent storm activity, Northern California could see "scattered and intermittent" episodes, said Peter Murphy, a marine debris expert at the National Oceanic and Atmospheric Administration, which recently received a $5 million donation from Japan to track and remove tsunami debris. To prepare, state coastal regulators have launched a cleanup project to document possible tsunami items that churn ashore. Working with environmental groups, volunteers will scour beaches with a checklist. It's like a typical beach cleanup, but the focus will be to locate articles from Japan. Until now, efforts in California have been haphazard. The goal is to organize tsunami debris cleanups at least once every season stretching from the Oregon state line to the Mexican border and then posting the findings online. Debris from Asia routinely floats to the United States. It's extremely difficult to link something back to the Japanese tsunami without a serial number, phone number or other marker. Of the more than 1,400 tsunami debris sightings reported to NOAA, the agency only traced 17 pieces back to the event, including small fishing boats, soccer balls, a dock and a shipping container housing a Harley-Davidson motorcycle with Japanese license plates. No confirmed tsunami debris so far has reached California. Even in the absence of a direct connection, California coastal managers said it helps to know whether a beach is being covered with more marine debris than usual. "We want to get an idea of where to focus our efforts. We have limited resources," said Eben Schwartz, marine debris program manager at the California Coastal Commission, which heads the $50,000 NOAA-funded project. "If we see the problem is hitting the north coast and not getting as far south as San Francisco, that tells us where to focus." In the summer, NOAA awarded $250,000 to five West Coast states to help with tsunami debris removal. Alaska spent its share to clean up a 25-mile stretch of beach before the weather turned too bitter. 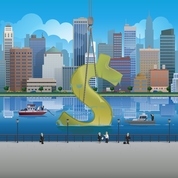 Hawaii and Washington state have yet to dip into their funds. Oregon racked up $240,000 to remove debris on beaches, including a 66-foot dock that broke loose from the port of Misawa during the tsunami and splashed ashore over the summer. Part of the tab — $50,000 — was covered by NOAA. Charlie Plybon, Oregon's regional manager at the Surfrider Foundation, said the tsunami has raised beachgoers' awareness about marine debris plaguing the world's coastlines. "There's a bit of tsunami debris fever. It's like an Easter egg hunt," said Plybon, who has been cleaning up the Oregon coast for more than a decade. "People used to walk past debris. Now they want to be engaged." Health experts have said debris arriving on the West Coast is unlikely to be radioactive after having crossed thousands of miles of ocean. Tsunami waves swamped a nuclear power plant and swept debris into the ocean. The debris field, which once could be spotted from satellite and aerial photos, has dispersed. More than 18,000 residents were killed or went missing. Volunteer Julie Walters has combed Mussel Rock Beach south of San Francisco for wreckage, but all that has turned up so far are wave-battered boat parts and lumber of unknown origin. If she did find an object with a direct link, "I would find it quite intriguing that it made this incredible journey across the Pacific," said Walters, a volunteer with the Pacifica Beach Coalition. "It would also sadden me to think of the human tragedy." Oceanic Conveyor Belt; Credit: UNEP Think island, think nature, think ocean, think tranquillity and think pristine. Natural islands have always been escape destinations from the concrete jungle chaos and pollution. Now think again, think unnatural islands, think strewn litter over the ocean, which eventually accumulate as floating marine trash. Who would have thought we could create whole human-made waste catastrophes in the far-off ocean? Plastic discarded in America may be carried for many kilometres over the oceans. Like our atmospheric currents, our oceans function as conveyor belts. The conveyor belt work done by the oceans regulates our climatic control. This role has been diminished by human-induced climate change, this affects human, marine and land life-forms. Adding trash conveyance to the equation, with extensive garbage being recklessly disposed of, we are suffocating the oceans and inhibiting their role on the planet. The ocean currents move in certain patterns across the globe. Five grand oceans, the Atlantic, Pacific, Indian, Southern and Arctic, they keep the planet cool yet warm enough for our existence and move with strength in an eight-shaped pattern, mixing, blending and moving things along. Atmospheric convection (unequal solar heating causing horizontal and vertical flows) and the earth's rotation are the major forces working on ocean movement producing belts of wind that dominant the planet. Two main wind-forms over the ocean are the trade winds and westerly winds. The friction caused over the ocean surface results in ocean currents. 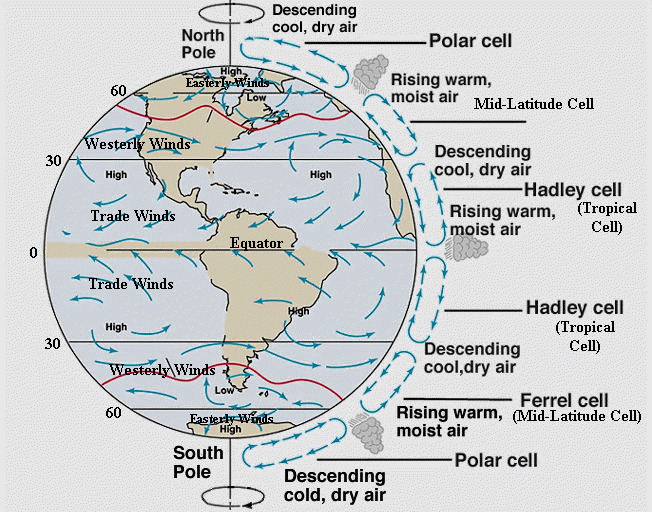 Source: geography.com The Earth's rotation (Coriolis Effect) and the presence of scattered continental landmasses, create a secondary wind-induced surface movement, the Gyre Currents. There are five main Gyres working either westward, eastward, poleward or equatorwards. 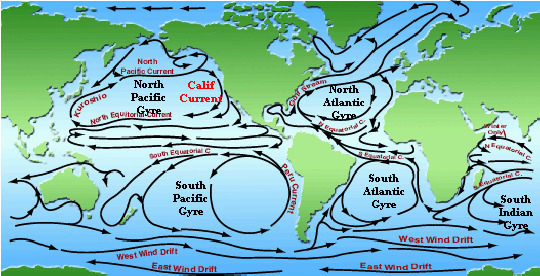 Source: geography.com Gyres may be seen as the secondary current force but they substantial impacts over coastal temperatures, currents and wind storms. In addition, gyres result in the slow movement of water allowing the trash to collect. The points of convergence are where the deposition of trash occurs and eventually build up to form floating trash islands. 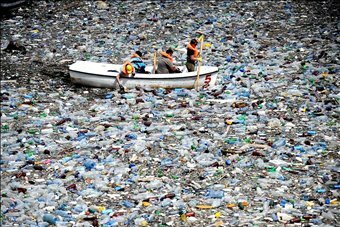 An area of concentration for waste over the ocean has been the 'Great Pacific Garbage Patch' located between California and Hawaii. This patch arises from the North Pacific Gyre. There other trash collection zones such as the Sargasso Sea waste hotspot (in the Atlantic Ocean), the Western Pacific Garbage Patch (off Japan's coastline) and the Indian Ocean Garbage Patch (only discovered in 2010). We stand at a growing global population of 7 billion. Not only have we overpopulated, but we have created a global society of waste generators, unnecessary tonnage of fossil-fuel created plastic is demanded in almost every product in our daily life, then we cast them aside instead of reusing and recycling. Landfill sites are out of capacity, land space for toxic dumps destroy wild-lands, vast quantities of domestic garbage are disposed of along rivers, eventually finding their way to the oceans and the obvious direct illegal disposals from sea vessels. Captain Charles Moore heading up a team of oceanic researchers discovered that 90% of the floatsam in the Great Pacific Garbage Patch is plastic. Plastic is a generic term referring to a range of human-made petrochemical products. Plastic refers to bottled water containers, caps on sodas drinks, plastic bags, bin-bags, take out containers, etc. Plastics in general take a long time to degrade and therefore are burden, but over land they degrade faster as opposed to in the ocean due to temperature and algal growth on the plastic shielding solar rays. However, plastics never fully degrade, they only become smaller microplastics. Plastic and other human generated solid waste are not only pollutants based on their chemical composition but they are physical hazards to wildlife. These hazards become evident when either ingested (choking hazard) or physically debilitating a bird's movement. The consumed pollutant also breaks down releasing toxic PCBs into the sea animal's body. In addition to plastic, fish nets also trap marine life. Marine animals become entangled in the nets and this can lead to injury, starvation and death. Marine life-forms also suffer from life-long disabilities from ocean garbage, namely, plastic bands fitting over baby marine turtles that cause huge physiological deformity as the animal grows (see image below). Source: Conservation Report, 2009 If we change our wasteful consumption, unnecessary production of new plastic products, dumping waste, we may save innumerable lives, they may not all be human, but we are responsible for them and all things living on the planet. 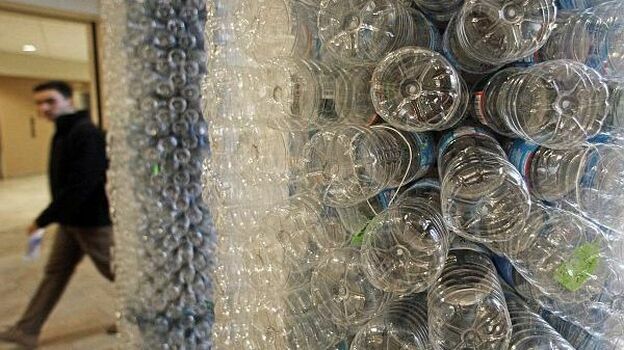 The Town of Concord's website describes the bylaw, stating "It shall be unlawful to sell non-sparkling, unflavored drinking water in single-serving polyethylene terephthalate (PET) bottles of 1 liter (34 ounces) or less in the Town of Concord on or after January 1, 2013." There is an exemption for an "emergency adversely affecting the availability and/or quality of drinking water to Concord residents."